How good/well does the nuisance call blocking work? Is there a limit to how many numbers you can block? We use the older model a420 for business. Battery easily lasts 2 days with at least 30 calls per day. Don't know how it compares to this newer one. my landline sits there gathering dust and i have the pleasure of paying line rental for that ! Does anyone even bother with landlines at home anymore? Is anybody still using these ? Apart from my mum just retired I don't know anyone ? Ohh.. Yeah my local take away got one .. hot then. Thanks, bought the one base unit with answering machine, £21.50 after buying a voucher through work scheme. Didn't want anything fancy, the Panasonic's look good but around £5 more, it will probably only get used a couple of times a week. Anyone recommend a twin handset with a shared phonebook? I.e regardless of which handset you update the phonebook on, both handsets see the same phonebook? Also would like speed dialling too! Best cordless house phone i have ever bought...superb! You can earn the extra nectar points on this. These any good? Showing as £89.99 on website, has this finished? I have the S850A/H they are fantastic as I'm sure the ones the op posted are. Very good sound quality even on loud speaker, good signal, I can walk quite a long way from the base, good battery life, easy to use, caller ID support good volume. Mine also support Bluetooth, VOIP etc and get notifications of missed calls and answer phone messages to my mobile (although my landline rings my mobile also). I could continue but just take my word for it. Gigaset are great phones. Heat from me as a bargain at this price! P.s. I live in the middle of nowhere so not bothered about the supposed security issues. Anyone hacking my phone would just get bored to death from junk voicemails! So if someone got passed security what could they actually do... I thought the device only allows VoIP calls externally, not remote access to the admin side of the system, unless you enable that, so unless someone was on my local network they can't do much, or can they? These are refurbished incase people didn’t realise as it’s not clearly written. Has it got Knob Blocker? Thanks buddy for your link..I ended up getting the triple for £44.99. Many thanks for your help. Same here, blocks all foreign numbers and with held numbers (BT) Large colour 1.8" TFT They always say large when it is not. Do these have speaker phone on these? Thank you, I've bookmarked that site, cheers.  http://checkstocknow.co.uk/ is better than Argos website for searching stock. Did you end up doing anything to the phone? I'd be interested in a custom ROM to get an android update. Hi, has anyone who got this rooted and installed any changes? I know there's a thread on xda but I've been reluctant to try so far. I'm not too impressed with the camera tbh, my p8lite seems to be better (less noise better focus), up close its good which makes me wonder if it's geared towards selfies etc :(. I read somewhere that if you hold the top right part of the phone to your ear, then the sound is louder. Has anyone installed a custom ROM on theirs to get an android update? Still using my gigaset and happy with everything, it was definitely a bargain. Anyone found a camera app that improves pictures over the stock one? How are you getting on with the phone? Did you install a different launcher? Got mine home and it had been repackaged. batteries lose in the box and it was not brand new, going back never told at the till. Naughty Naughty Argos. Thanks Op. Bought one today..... to gift my sister. Reserved and collected on Friday, but will return tomorrow. PROS: Big clear display, reasonable loud speaker phone, responsive buttons. 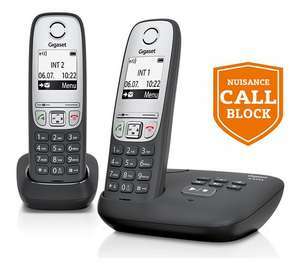 CONS: Overly-complicated interface (I'm computer literate), horrible ring tones (this is subjective), nuisance call facility is a joke (only 15 numbers), and most important for me it doesn't work with other standard DECT phones (I suspect Siemens proprietor firmware). 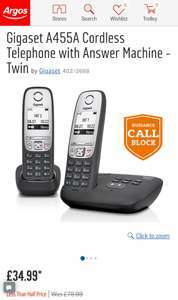 It is a good price if you only want a twin set without nuisance call-blocking. How times have changed. £150 for one handset 18 years ago! I still have BT Siemens! Thanks - ordered. The reviews look pretty good and sound quality was more important than the call blocking capability to me. In fact, the call blocking looks pretty useless. Can anyone tell me if these work abroad. Ie Germany? I wonder if these play nice with the N300IP base station. 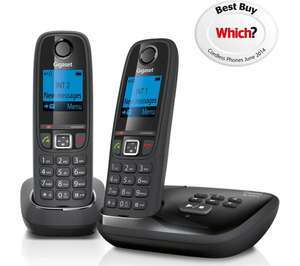 I assume these are in competition with the BT 8500 call block models, available marginally cheaper as a duo at £48 with inclusive 2 year warranty via John Lewis. I have not had one unwanted call since starting to use the BT 8500. Said it was available online so added it to basket but at final confirmation it got removed from basket as not available, same thing for click and collect. what's wrong with these ***** stores ? Great phone. You can even set up a contacts list on the main handset and copy it to the others. Just setting mine up now. The handset has a few annoying quirks - you need to hold down the green Call button for two seconds in order to make a call! The Mute button (on the bottom right of the handset) is a great addition as I use it often when I'm on speakerphone on hold - but it doesn't seem to indicate Mute on/off on the display. (Ah, actually, when in-call it says "Mute" on the display when you press it). Holding down the * key for two seconds also turns off the handset ringer volume. Mine seems to be taking a while - online it simply says "Shipped - Complete". My store isn't too far away so I popped in, will be there next week, I was told. Kinda wish I'd got it delivered now! My first deal so go easy on me. Found these in the Tesco in Beaumont Leys. Great price for a triple handset, seen these online for over £60 in some places. good deal Runuali, but no one else will find these Tesco deals..
Are the speaker phones loud on these?